The iSaddle Digital System is Duplo's sheet-fed saddle stitching system, combining the DSF-2200 Sheet Feeder with the saddle stitcher. The DBMi Saddle System is Duplo’s heavy-duty, high volume collator and saddle stitcher; and the first in its class to deliver the increasingly popular, letter landscape booklet. 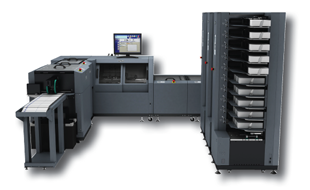 Designed to handle both traditional offset work as well as shorter-run digital jobs with equal ease and efficiency, the fully automated DBMi combines PC-based programming and intelligent feeding with scoring and folding technology of the highest quality to produce thicker, flatter booklets up to 4,500 booklets an hour. • Feeds larger sheet sizes up to 9.05" x 24"
Interested in the Duplo iSaddle? Contact us to see what this Bookletmaker can do for your business!